Ferdinand Porsche is well known as car engineer. He had many patents and developed ideas for creation of tanks and airplanes. In 1920 he had an appointment with engineers from Mercedes – Benz. After this appointment he set up new engineering workshop. He has constructed Volkswagen. Several years later he began to work with the idea of the second car with his son, Ferry Porsche. This new car had name Porsche 356. This car had much in common with Volkswagen. New car had the same four – cylinder engine. It was not sport car and maximum speed was about 140 km/h. But the Porsche 356 had attractive and wonderful appearance. For the production of the car was used the same techniques and design as for VW Beetle. In several years this style became very popular, especially for sport cars and received the name “fastback”. The next Porsche car was Porsche 911. This car is very recognizable. It has attractive bonnet and “frog eye” headlights. The waistline is straight and the windscreen is wide. This car has much in common with BMW 1500 from technical and functional point of view. But the stylistic of Porsche is unusual. During the 1970 – 1980 the Porsche Company was almost in disaster. But two models – 924 and 928 returned the fame to the company. These to models are examples of new style and concept. During the 90`s the models became more classic and it was an advantage for company. The production of cars became very profitable. 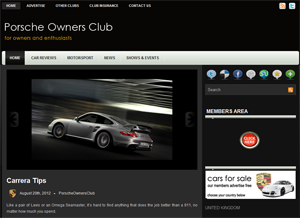 The Porsche car presents the best combination of price and quality for racing and sport models. One of the last successful models of Porsche is the Porsche Boxter.